These ESL Phonics guidelines can improve your reading and spelling. They can help you recognize words and spelling patterns. ESL Phonics instruction is a little different than the phonics English-speaking children study. Most people studying English as a second (or third or fourth) language are already literate. If that describes you, you may find that just a little ESL phonics instruction can help a lot in recognizing words you know, as well as understanding how to pronounce and spell new words. Standard English has about 42 sounds (with some differences for different dialects), but only 26 letters. Another problem is that many letters can be pronounced in two or more ways, and most sounds can be represented by more than one letter. There are historical reasons English spelling does not correspond more closely to its sounds. heavy borrowing of words from other languages, often retaining part of their foreign spelling. On this page I’ll try to give a brief explanation of the most common sounds of each letter of the alphabet. Note that most consonants have one main sound, with common exceptions noted afterwards. Vowels-- A , E, I, O, & U-- have long, short, and ‘r’-controlled sounds, as well as the ‘schwa’ sound for unaccented syllables. For more information on vowel sounds, including vowel combinations (digraphs, in which the combination has a different sound than either individual letter would have in the same location in a word, and cases in which one vowel is silent) see Short and Long English Vowels and English Vowel Digraphs. See also Consonant Digraph Sounds, which give the letter combinations that can also represent English sounds. 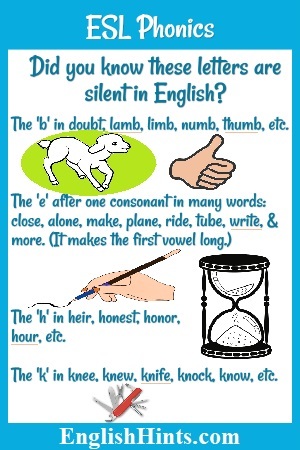 Sometimes ‘b’ is silent, especially after ‘m’ or before ‘t’: comb, debt, doubt, dumb, lamb, numb, thumb. cent, celery, certain, cipher, fascinate, lice, race. D makes a ‘t’ sound after certain (unvoiced) consonants: baked, hoped, fixed, guessed, washed. Silent E (makes the preceding vowel long): close, cube, like, name, take. face, feel, fluffy, free, puff. G makes a hard ‘G’ sound before A, O, & U, as well as before L & R and at the middle and end of words: drug, game, gave, glass, glitter, gold, got, grass, great, rag, seagull, segment. It usually makes a soft ‘J’ sound before E or I:generous, genetic (the same beginning sound as Jennifer), ginger, gist. hair, half, help, hero, hit, home. An initial ‘h’ is often silent, (depending on its derivation: the language it came from): herb, honest, honor. 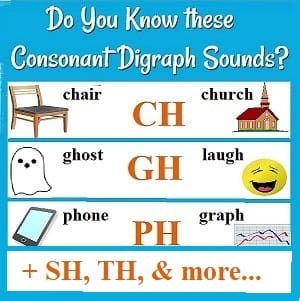 See also CH, GH, PH, SH, TH, and WH in Consonant Digraph Sounds. Long I: five, nine, right, write. Short I: in, pill, sick, six. J is usually pronounced /dʒ/ in English: jam, John, juice. For more J sounds see G.
back, bake, keep, kind, kiss, make, rack, truck. At the beginning of words, we usually use K before E or I, and we use C for the /k/ sound before A, O, or U. For KN see Consonant Digraph Sounds. all, lake, lack, light, lily, listen, love, silent, still. am, make, mine, moment, some. any, man, name, nine, none, turn. Long O: alone, boat, bone, cold, no, note, open, own, rose. Short O: dog, drop, hot, mop, not, on, stop. apple, pay, pen, pie, place, pretty, top, wrap. (sounds like 'kw'): quantity, queen, quit, quite. air, arm, baker, bird, charge, fur, hear, or, ran, red, rose, service, turn. backs, glasses, maps, mats, pots, say, sell, sold. See also Z (which is the sound S makes after a voiced consonant like B, D, G, L, or R) and see SH in Consonant Digraph Sounds. at, met, pot, tall, test, taught. See also TH and TION in Consonant Digraph Sounds. Long U: cube, tube, mute, use. Short U: cup, tub, under, up, us. give, leave, love, value, very, visit, voice. want, water, week, wife, will, wood, word. W is silent in many words beginning WR: wrap, wreck, write, wrong. X usually makes the sound /ks/: box, excited, six, toxic. Y makes the International Phonetic Alphabet /j/ sound: year, yellow, yes, yet, you, young. This has been a summary of some of the most important or helpful ESL Phonics hints for recognizing the words you read, guessing word pronunciations from their spellings or spellings from pronunciation. Even native English speakers are often unsure how to pronounce a word they read but have not heard. Don’t worry too much about getting it perfect. Keep listening and keep reading, and more and more words will become familiar to you! Check out Listening and Reading Comprehension Exercises for several at different levels, as well as quizzes to check your understanding afterward. Learn the different sounds consonant digraphs can make. Learn the basic rules that can help you recognize which sounds English vowels will make in different words. "Vowel digraphs are letter combinations in which the two vowels together make a single sound." Recognizing them can improve your reading comprehension, pronunciation, and spelling.